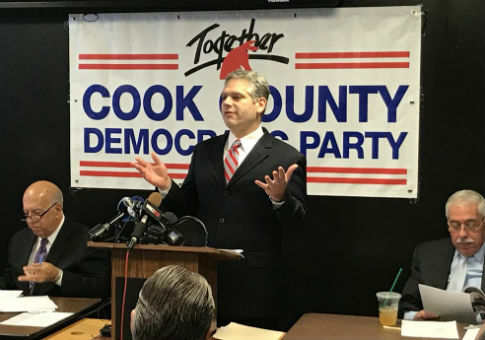 A Democratic candidate running for Illinois attorney general was robbed at gunpoint on Thursday afternoon while taking promotional photos for his campaign, according to his campaign manager and authorities. Aaron Goldstein, 42, and several members of his campaign team were taking publicity shots in the middle of the afternoon when three men in their early 20s approached them, according to the Chicago Tribune. One of the men flashed a handgun and demanded the camera equipment and other personal belongings from the team, according to police. The gunman and two other men robbed Goldstein and four others of camera equipment and their cellphones before they ran away, the law enforcement source said. As of Thursday evening, no one was in custody, police said. Police described the three suspects as between 20 and 24 years old. They did not release a detailed description of the suspects. Campaign manager Robert Murphy, who was not with the team during the incident, said Goldstein, Democratic ward committeeman for the 33rd Ward and a resident of Albany Park, was taking promotional images for the campaign with an "in-the-neighborhood kind of" message. Murphy said that Goldstein, a supervising attorney at the Cook County Public Defender's Office, and other campaign staff were not hurt in the robbery and that police later assured them the robbery was not a targeted act. "So, as far as the campaign, we are moving forward," Murphy said. "Basically, this was a totally random act of violence in the community. But when it happens to you, of course, you're shooken [sic] up." "He says he's fine, and he was concerned about everyone else instead of how he is—but that's just how he is," Murphy added. Goldstein, who formerly served as one of disgraced former Illinois Gov. Rod Blagojevich's (D.) defense attorneys, is in a crowded field of eight candidates in the Democratic primary for attorney general, following Lisa Madigan's announcement that she would not run for reelection. This entry was posted in Politics and tagged Democratic Party, Illinois, Rod Blagojevich. Bookmark the permalink.